Brian Finke turns his attention to New York City building sites for his third monograph, Construction. 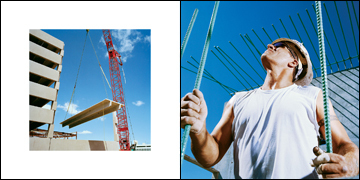 As with his previous series (which focused upon such subjects as flight attendants and high school cheerleaders and football players), the new work examines a group of peoplethis time construction workerswho are often represented in broad and stereotypical terms. Consistent with earlier projects, Finke zeroes in upon postures, expressions, and gestures, representing the individuals who comprise the group. While revealing diversity in uniformity, Finke also details the establishment of individual identities in the image of the larger group or industry. The artist states, “I have always been attracted to photographing within groups, immersing myself in the scene, almost becoming one of the members.” And by submerging himself in a given stratum, Finke is able to shoot largely unnoticed. 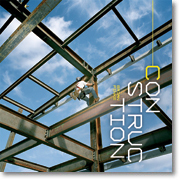 The result is a personalized view of the construction industry that seamlessly blends the heroic with the mundane. But in contrast with his earlier photographs, the images from Construction incorporate much more of the surrounding environments. Finke shoots the workers in relation to the machines they operate, and then contrasts the scale of these seemingly small men, women, and machines to the mammoth structures they erect. Whitney Johnson is the Director of Photography at The New Yorker where she produces and researches photographs for political and cultural stories, including award-winning portfolios on the United States military and world leaders. She also writes for the magazine’s photography blog, Photo Booth.